I have read the question "Is there a dress code when visiting the Vatican in Rome?" carefully and I thought "the better covered the more welcomed" just like the photo suggested. However the question has not discussed the Islamic clothing ie Hijab and/or veil and this tripadvisor review freaked me out. 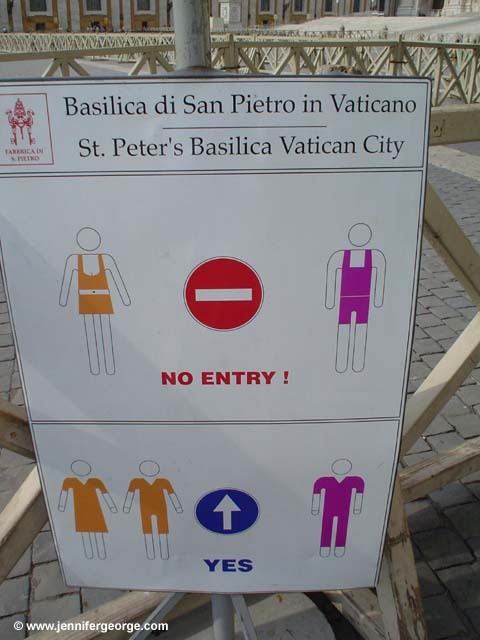 Note that the sign is specifically for St. Peter's Basilica, and not Vatican City. A small point considering the size of the place, but you have asked about Vatican City. If she is wearing the Hijab then there will be no issues; covering of the head/hair is common as a sign of respect (for women, for men, its opposite - you can't wear hats); and as mentioned in the comments she will be in good company as many nuns also cover their body save for the face. If she is wearing the Niqab (face veil) you may have an issue - but it will have to do with security more than any religious sensitivities. Of course, if you are visiting many of the museums in the Vatican City you will not have such stringent requirements. Not the answer you're looking for? Browse other questions tagged legal religion islam vatican-city or ask your own question.